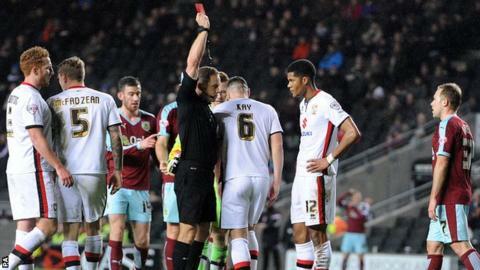 MK Dons boss Karl Robinson has admitted his team "looked punch-drunk" in their 5-0 home defeat by Burnley on Tuesday. The Buckinghamshire side conceded four second-half goals and had Antony Kay sent off, leaving them just a place above the Championship drop-zone. "It's a David and Goliath every week and we have to box clever and a little bit wiser," Robinson said. "The players in there, they're really really hurt and I said to them 'let it hurt you as much as you possibly can'." The Dons are now without a win in four games and have not kept a clean sheet since November. It was not their biggest loss at Stadium MK this season, as they were thrashed 6-0 by Premier League Southampton in the League Cup. "Do you stand there and let it knock your confidence and deject you to the point where you want to shrivel up and hide, or do you put on your armour of shield on, stand there shoulders back and take the criticism and move forward and galvanise this place? That's what we need to do," added Robinson to BBC Three Counties Radio. "I don't think we lacked effort, it wasn't a case of players not running around or working hard, they just looked punch-drunk. "If they have a sleepless night and I guarantee I will, good - let that aggression stay inside you for Saturday." Robinson is hoping to bring in a defender and believes the return to fitness of former England international Matthew Upson will be a boost. "He could be massive. He could even start in the cup game (FA Cup third-round replay against Northampton) and once we get him through that, we'll take a note of where we are," Robinson added.